Oriflame is proud to unveil its first skincare range proven to address all deficiencies of the skin related to menopausal ageing. Time Reversing Intense SkinGenist™ combines the potency of GenisteinSOY – Oriflame’s ground-breaking ingredient that stimulates the three core beauty genes – with Amino+ complex to help skin regain plumpness and youthful structure. During and after menopause, the skin begins to dramatically lose its density, volume and plumpness. This happens because the proteins that make up the supporting structure of the skin, known as collagen and elastin, are compromised. At the same time the skin loses important sugar molecules (GAG) that attract water and make the skin plump and bouncy. Time Reversing Intense SkinGenist™ addresses this crucial skin change with the use of Amino+, a peptide-based active that promotes the skin’s primary supporting components such as collagen, hyaluronic acid and glycosaminoglycans to improve and restore skin density. The result is visibly plumper skin with less sagging, reduced wrinkles and improved facial contours*. The anti-ageing action of Time Reversing Intense SkinGenist™ is enhanced with GenisteinSOY, an innovative and revolutionary anti-ageing nutrient originating from natural soy protein, that is the result of 10 years’ intensive research by Oriflame’s leading scientists. GenisteinSOY has proven antioxidant, photo-protective and youth protein boosting effects, and also acts at the genetic level to stimulate a trio of genes essential to the maintenance of youthful-looking skin – the ‘anti-dryness gene’, the ‘cell rejuvenator gene’ and the ‘structural gene’. Time Reversing Intense SkinGenist™ is further enriched with Rock Rose and Vine Orchid extracts to protect and reinforce the needs of mature skin. It also contains L-Glutamine, an amino acid which acts as a cellular ‘fuel’ to help reactivate ageing skin cells. 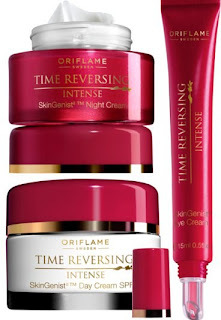 Oriflame has tested the Time Reversing Intense SkinGenist™ Day and Night Creams on a panel of 108 women over 55 years old with truly remarkable results; participants reported such effects as plumper and fuller (82%), less saggy (76%), more radiant (90%) skin, diminished facial wrinkles (75%), firmer skin (80%) and more even skin tone (81%). Oriflame’s Time Reversing Intense SkinGenist™ products are what every mature woman has been looking for. With its key ingredients of GenisteinSOY and Amino+, the range is proven to restore all deficiencies of the skin related to menopausal ageing: deep wrinkles, lack of bounce and radiance, thinning epidermis and many more. Time Reversing Intense SkinGenist™ products give women the power to feel confident in their skin again, in the most elegant and effortless way. The range will be available at the following special launch offer prices from March 16 – April 12: Time Reversing Intense SkinGenist™ Day Cream SPF15, £16.95, Time Reversing Intense SkinGenist™ Night Cream, £16.95, Time Reversing Intense SkinGenist™ Eye Cream, £8.95.